Very often you hear people say how chocolates and wine go very well together, and that they are a pairing made in heaven. But that’s not how it always is; not every wine pairs well with all chocolates; the most premium wine may taste delicious on its own and so may your favourite chocolate. But pair these and you may just end up creating a mini storm on your palate. There are some 85% coco solid-base chocolates that can pair well with full-bodied reds that have supple tannin and sweet, rich fruit flavours and the combination can be magic for your taste buds; but you need to make sure they are carefully matched. Most reds tend to be excessively tannic and dry to work well with chocolate. For instance, a Turkish delight trifle has chocolate biscuit pieces and chocolate ganache in it; you should try pairing this with Chalmers appassimento sagrantino. While this is technically a red wine as red grapes are used in making it, these are first air dried and then fermented which softens the tannins and lends the wine a delicious sweetness. Banyuls is another great pairing with chocolate. This is a fortified, sweet wine that’s made in the Southwest of France, from Grenache vines. It has a rich plummy sweetness from the ripe fruit which adds dimension to the wine and perfectly complements the intensity of 85% cocoa solids chocolate. 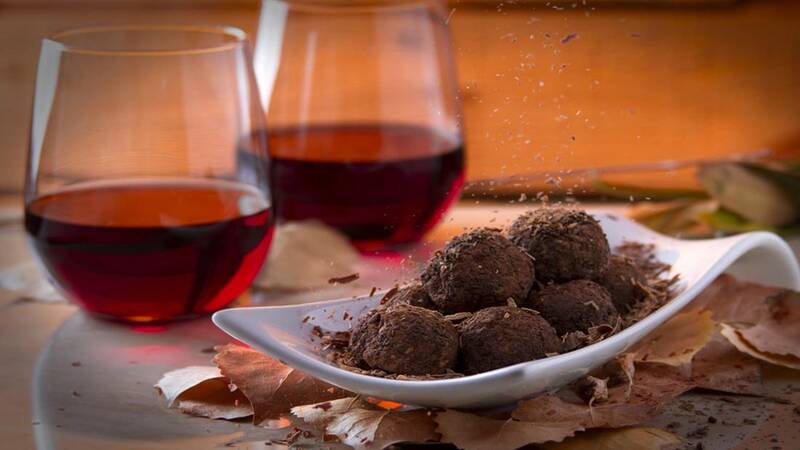 If you have chocolate on the table, when you have invited guests for dinner, make it a point to open up some fortified wine. Of course, you’d have to experiment a bit with wine flavours and chocolate textures before you find a perfect pairing. Big dry reds go very well with dark chocolate that has a certain amount of sea salt. However, the classic matches are milk chocolate with sweet muscat and dark chocolate with vintage port or vintage fortified. The latter can be served with hard cheeses and dark chocolate as the saltiness of the cheese softens the tannins in the wine and prepares your palate for the chocolate. Peninsula and Madeira fortified wines go very well with chocolate; but its best to avoid wines such as Pedro Ximénez sherry that are luscious and excessively sweet. Instead, try intense-flavoured, medium-fortified wines that have matured and developed high-toned characters. Choose dark and slightly bitter chocolate to go with these wines and they will cut through and create an excellent match. Oloroso is great, and nutty amontillado with its intense nutty flavour works well as a chocolate pairing too. The boal grape-based old medium-sweet Madeira also pairs amazingly well with fine, dark chocolate. Darker chocolate is better, as the sweetness in the wines gets the chance to shine. Try these matches and you may give chocolate and red wine a permanent miss. Store your fine wines in a temperature-controlled cellar. They will age well and you will have them at hand every time you feel like a glassful of wine and a nibble of dark chocolate. For information about custom wine cellar design and installation, you can call Signature Cellars on 02 9340 7515 or use this contact form to get in touch with us. We’ll be pleased to assist you and provide custom solutions that match your requirements.